Statistics from BusinessFunding.co.uk's database - which tracks over 1,000 UK business funding sources - show the number of public sector-backed funding sources available to companies has shrunk by at least a quarter in the last year alone, and the number of grant schemes has shrunk by a similarly large amount. 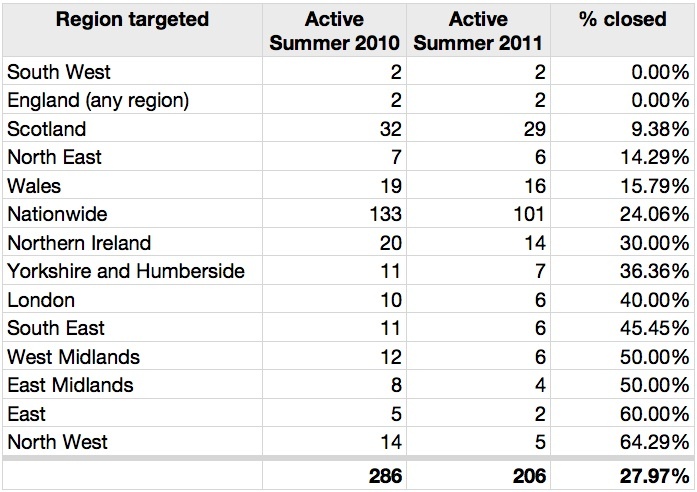 Its key finding is that of the 286 public sector-backed funds it was tracking a year ago, 80 (28.0%) have since closed, with the North West particularly badly hit (see Table 1). Similarly, on grant funding: of the 250 grant funding sources tracked that were active a year ago, 64 (25.6%) have closed (see Table 2). 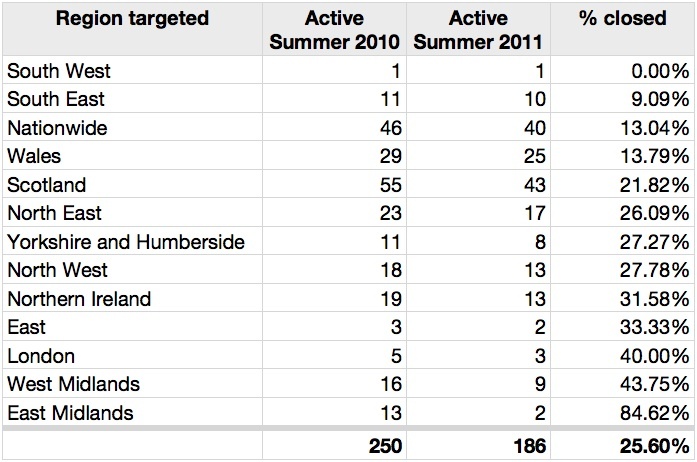 Here, nationwide schemes and those targeted at the South have been relatively protected, whereas those targeted specifically at the Midlands have fared badly. With spending cuts progressing apace across a wide variety of business funding sources, this trend looks set to continue. The research extends across the gamut of the BusinessFunding.co.uk database, which tracks the activity of over 1,000 funding sources, including almost all of the major equity investor organisations (venture capital funds and business angel networks) and hundreds of business lenders (from general business loan providers to specialist providers like invoice discounters). With the evident decline of public sector and grant funders, UK start-ups and SMEs must diversify the range of options they look to when seeking funding. The good news is that a wide variety of less-well-known funding sources do exist, from specialists such as asset-backed lenders and business cash advancers and from more traditional equity investors. According to BusinessFunding.co.uk's research, these equity investors have provided funding over £500m into UK companies so far this year. The BusinessFunding.co.uk website aims to help those businesses looking for funding but unsure as to their options find funders who are prepared to assist them. Dr Stephen Bence, Founder and Director of BusinessFunding.co.uk, says: "We were often being asked to compile lists of properly-qualified funding sources for a particular project or company. We found these tasks incredibly time-consuming because the information could not be found in one place - not to mention the complexity of the funders' eligibility criteria. “This is our solution to that problem: a comprehensive and detailed database of funding sources coupled with an easy-to-use online tool to help direct businesses towards the sources of funding and finance that are most suitable for them". Launch partners for BusinessFunding.co.uk include: Baker Noel Chartered Accountants, the legal firm Vincent Sykes & Higham, the Public Relations firm Presswire and the digital search agency Red or Blue. Public sector funding' refers here to funding which originates from the UK government, devolved governments, regional and local government (i.e. Regional Development Agencies, Local Authorities and County Councils) as well as some funding from the European Union. It refers to any funding that is, ultimately, taxpayer-backed. BusinessFunding.co.uk is the central resource for businesses seeking funding or finance to start, grow or survive the downturn. Founded by a team with in-depth experience of the UK funding landscape and the practicalities of funding, the new service is backed by 18 months of research to provide a comprehensive and practical website combining high-quality independent information and primary research on over 1,000 business funding sources. Smart tools help businesses discover suitable funders. BusinessFunding.co.uk's monitoring of most UK-based investment and funding firms means it is able to derive detailed statistics on activity and trends.